Ingest and play back high-resolution video and audio for digital signage, real-time capture, or media player applications with the DeckLink Duo 2 Mini Capture and Playback Card from Blackmagic Design. 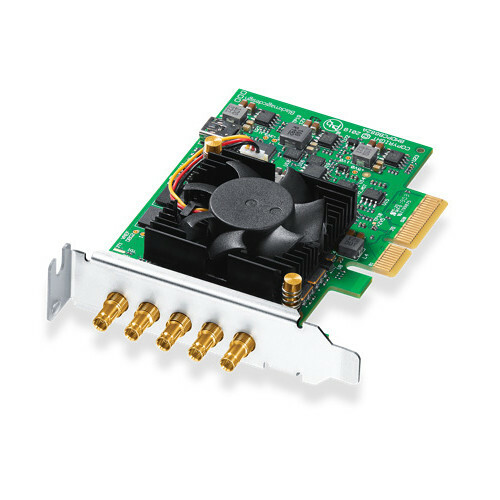 The Duo 2 Mini is a PCIe card that features four bidirectional BNC SDI inputs/outputs. These multi-rate connections accept 3G/HD/SD-SDI input and output signals, providing support for resolutions from SD to HD 1080p60. Additionally, the DeckLink Duo 2 Mini includes a reference input and supports 16 channels of 48 kHz 24-bit audio. The DeckLink Duo 2 Mini offers flexible format and system support, letting you work with popular compressed video formats such as ProRes, AVCHD, XDCAM, and DNxHD, as well as up to 12-bit uncompressed video. When working with uncompressed video, all images are pixel-for-pixel identical to the source, without any generational loss. This lets you get sharper keying with green screens, cleaner compositions, superior color correction, and more. Support for common file formats provides ready-to-edit files for use in popular editing, effects, and design software applications. The DeckLink Duo 2 Mini is compatible with macOS, Windows, and Linux-based workstations. Drivers and utility software are included on an SD card for the supported platforms. Supports major software applications such as DaVinci Resolve, Fusion, Final Cut Pro X, Adobe Premiere Pro CC, Avid Media Composer, Adobe After Effects CC, Avid Pro Tools, Steinberg Cubase, Steinberg Nuendo, and Adobe Photoshop CC. Other supported applications include The Foundry Nuke, Grass Valley EDIUS, Sony Catalyst Production Suite, Tools On Air Just: Play/Live/In, Softron MovieRecorder/MReplay, Adobe Flash Media Live Encoder, Telestream Wirecast, Livestream Producer, Resolume Arena, Magix Vegas Pro/Movie Edit Pro Premium, Corel VideoStudio Pro, CyberLink PowerDirector, Vidblaster X/Studio /Broadcast, Uniplay One/CG, CasparCG Server, Magicsoft CG, Xsplit Broadcaster, Imagine Communications Velocity/InfoCaster, DevTek Easy Media Suite, Metus Ingest, Boinx Software MimoLive, Cinegy Capture Pro, vMix Live, Renewed Vision ProPresenter, Ventuz Director, Class X Liveboard/Coral CG, Glookast Capturer, Open Broadcaster Software Studio, and Nautilus NEMO3D. What do you mean by &quot;four bidirectional BNC SDI inputs/outputs&quot;? can I plug a screen and use it as an output as well? Each of the connections may be configured as either an input or an output but obviously not at the same time. Will standard size bnc connectors plug into this card or does it need adapters to fit the mini connectors? Yes they are standard BNC connectors.